Thanks to all the wonderful holiday movies that are playing on television, and new movies arriving on DVD and Blu-ray each week, my family is getting in the holiday spirit and can't wait for December to arrive so that we can start doing things like grabbing cocoa and a warm blanket and driving around to check out Christmas lights in town, visiting the local churches for their holiday recitals and programs, and baking, and do fun Christmas arts and crafts. There are also a handful of holiday movies coming soon to the theater after Thanksgiving, which we are counting down the days for. As we wait for these movies, we have been enjoying some great new DVD releases including the new movie featuring Mariah Carey called "All I Want for Christmas is You." Not only does Mariah Carey star in the movie as the lead character, but she also lends her voice to an original song (scroll down to see a clip of "Lil Snowman") which my girls and I fell in love with when we first heard it yesterday while watching this movie. "Narrated and executive produced by Mariah Carey, the animated family film follows little Mariah as she chases her dream of having a puppy of her very own, making her ultimate wish for Christmas come true. When Little Mariah (Yde) sees a darling little puppy named “Princess” at the pet store, she suddenly knows exactly what she wants for Christmas. Before her Christmas wish can come true, she must prove that she can dog-sit her uncle’s dog, Jack, a scraggly rascal; in fact, the worst dog in the county! Jack turns Mariah and her family’s perfect holiday preparations upside down in hilarious ways. It wasn’t exactly the Christmas she wished for…it was more than she ever wanted. 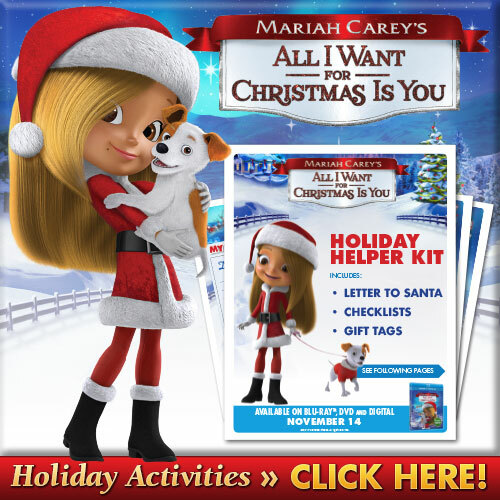 Based on the iconic Christmas song and popular illustrated book of the same name, Mariah Carey’s All I Want for Christmas is You featuring Mariah’s music and narration will be a family favorite for years to come. Mariah Carey’s All I Want for Christmas is You is executive produced by Mariah Carey and Stella Bulochnikov for Magic Carpet Productions (AChristmas Melody, “Mariah’s World”) in partnership with producer Mike Young and Splash Entertainment (“Kulipari,” “Norm of the North”). It is directed by Guy Vasilovich (Lego Star Wars) from a script by Temple Mathews (Return To Neverland, The Little Mermaid 2: Return to the Sea)." Like said, we received this movie yesterday to review, and the girls couldn't wait to see it, especially Savannah who loves anything dogs. The story line is simply -- Mariah wants a dog for Christmas, but after asking Santa for years for a dog, he seems to always forget to bring her one. She ends up falling in love with a cute dog named Princess at the pet shop and will do anything to get this puppy. Her father said that if she can dog sit for her Uncle's dog, Jack, and that if all goes well, that she could get Princess. But, Jack was not your average pup. It turns out he was a stray and really wasn't Mariah's Uncle's dog. She doesn't find this out until the end of them movie, after all the craziness that Jack brings. Mariah had no idea that taking care of a dog was so much work, and the manual she had didn't help her tame Jack's wild ways. Thankfully, her grandmother was helpful especially when telling Maria Jack was teething and that is why he was eating and biting everyone, and that a bone would fix it. But, wherever Mariah went with Jack or whenever Jack got loose, he always made a mess of things, and all Mariah kept hearing was how Jack was a bad dog. Mariah had her heart set on Princess and the only way she would get her dream puppy was if she could successfully dog sit Jack. So, she had to grin and bear it, even if she wanted to throw in the towel so many times. Both of my girls really enjoyed this movie, and fell in love with Jack. They got all upset at the end when Jack ran off and no one could find him. Mariah's family told her that she had to rush to the pet store if she wanted to adopt Princes. They went, but in the back of her mind she kept thinking and worrying about Jack. She had to decide if she wanted Princess as another little girl was also looking at the puppy. But, Mariah's heart told her that Jack was her dog, and she quickly left the pet store and with the help of her friends went around town looking for Jack. Jack was eventually found, and Mariah told the dog that she wanted him, and that he wasn't a bad dog like she and others kept telling me. This movie ended with a happy ever after -- perfect for a wonderful family-friendly holiday movie. My girls really enjoyed this movie and can't wait to watch it again. I see this being a popular movie to watch at the holidays. And, the songs included in the movie will have kids getting up to dance and sing. The Universal 1440 Entertainment banner develops and produces live-action and animated non-theatrical productions directly for distribution inall media worldwide. Since its formation in 2005, the group has assembled an exceptional roster of animated family fare, including the Daytime Emmy®-winning Curious George television series for PBS Kids and Hulu; as well as the latest installment of the beloved The Land Before Time film series, The Land Before Time: Journey of the Brave. The group also has successfully built upon some of Universal’s highly celebrated live-action, comedy and drama franchises, Scorpion King, Death Race, Jarhead, American Pie, Honey and Bring It On. In addition to the all-new animated family film Mariah Carey’s All I Want for Christmas is You, projects currently readying for release include the latest in the terrifying suspense sagaCult of Chucky, the newest installment of the epic sci-fi adventure hit Tremors and the next chapter of the cherished cheerleading comedy Bring it On: Worldwide #Cheersmack. Universal 1440 Entertainment is a production entity of Universal Pictures Home Entertainment (www.uphe.com). Universal Pictures Home Entertainment (UPHE) is a unit of Universal Pictures, a division of Universal Studios. Universal Studios is part of NBCUniversal. NBCUniversal is one of the world’s leading media and entertainment companies in the development, production and marketing of entertainment, news and information to a global audience. NBCUniversal owns and operates a valuable portfolio of news and entertainment networks, a premier motion picture company, significant television production operations, a leading television stations group and world-renowned theme parks. NBCUniversal is a subsidiary of Comcast Corporation.